An estate planning, asset protection and business attorney, Corinne Pforr makes it her mission to provide clear answers, sound guidance and effective strategies tailored to each client’s concerns and objectives. 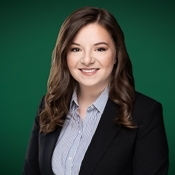 As an estate planning attorney, Corinne works closely with individuals and families to craft estate plans and wealth protection approaches designed to maximize the amount of assets passed on to the next generation while minimizing tax liabilities. She understands that the start of every plan is based on what her clients want to achieve in the end. Accordingly, she listens closely and actively, keeping client goals front and center when preparing wills, trusts and powers of attorneys for property and healthcare. In her corporate practice, Corinne assists entrepreneurs and business owners with the selection and formation of business entities, document preparation and the drafting and reviewing of contracts. Corinne worked as a law clerk at Chuhak & Tecson while earning her J.D. from Loyola University Chicago School of Law, gaining practical real-world experience in a range of practice areas. Her law school career also included serving as a judicial extern for the Honorable Pamela Meyerson in the Circuit Court of Cook County and as a member of Loyola’s Consumer Law Review. In her free time, Corinne enjoys traveling, exploring the city of Chicago and trying out new restaurants with her friends and family.